Please let us know your preferred mailing time & date, and we will confirm availability. 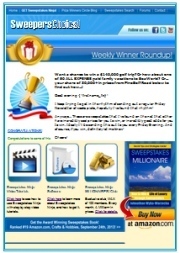 The image on the left is a sample picture of what the newsletter would look like. It usually contains several informative articles to people interested in sweepstakes. Your solo mailing would consist only of your promotion, in addition to any text/articles we included. (An optional non-exclusive mailing, in which your promotion is sent out with other sweepstakes/contest listings, is availble for $59. E-Mail us using our online contact form if you would like this instead). Prize pools tend to work better if there are several prizes to be awarded. (I.e., a promotion with one medium sized prize and several smaller ones would tend to do better than just one grand prize). Mailings are subject to approval. If they are not approved, your order will be refunded. 1. Please click here. We use BMTMicro to process orders securely. 3. You will then be contacted within 1-2 business days to confirm mailing.